A film that tells the story of the Dutch coffee brand Coffeecompany. The film leads us through the coffee process from bean to cup. From how the berries are farmed to the variety of brewing methods they serve in their stores. Taking their distinctive coffee table as a basis, we decided to tell the whole story within the concept of a table. So we started building a long table, 17 meters to be exact, and moulded all of the graphics into the table tops. Scale models were glued, ticking clocks programmed and coffee berries were sculpted. For the shoot, a 19 meters long automated dolly was custom built, so we could capture all of the magic in one table top shot. With our best friends and baristas united, we created a 3 minute one taker that tells the complete coffee story. Together with Firma Film and From Form we joined forces to design and built an ident for TV format and production company H5NX. With an old darkened factory hall as our playground, we transformed the typography of H5NX into 4 luminous structures. 300 test tubes, tonic and black light became a giant ‘H’, while a 10 feet tall illuminated grid formed a pixelated ‘5’. The catch of the concept lays in the position and sizes of these giant characters; the logo only shows itself when viewed from one particular point-of-view. irProjector is an installation which creates projections with infrared light, making it invisible to the human eye. These projections are pointed at the field of view of CCTV cameras in the city of Rotterdam. With projected images and texts such as “Error 404: Privacy not found” it creates an awareness of privacy at the securtiy guards monitoring these cameras. The functionality of irProjector’s is quite similar to the one of a regular slide projector, with the difference that it projects infrared light. Below you can also see a few of the dia slides used to create the projections with. 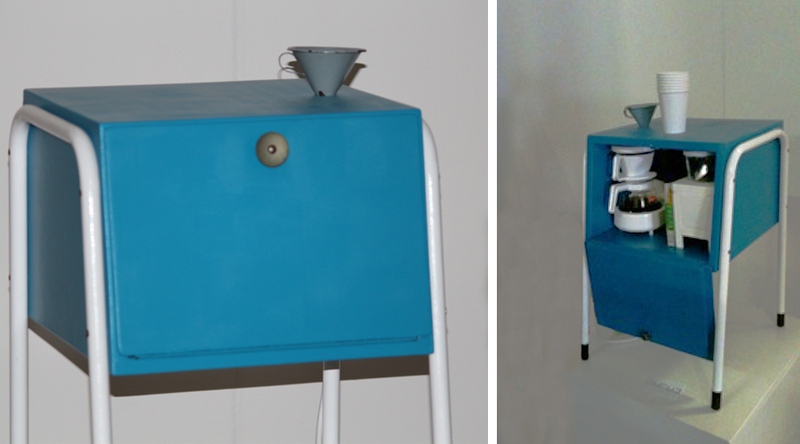 CoffeeCall is a small night table that holds a coffee machine. After your wake up alarm clock goes off, it makes you a nice cup of coffee. It’s also possible to call the coffeeCall with your phone when you’re on your way home, to make sure there will be coffee ready when you arrive! The small funnel on top allows you to refill the coffeeCall for it’s next use. 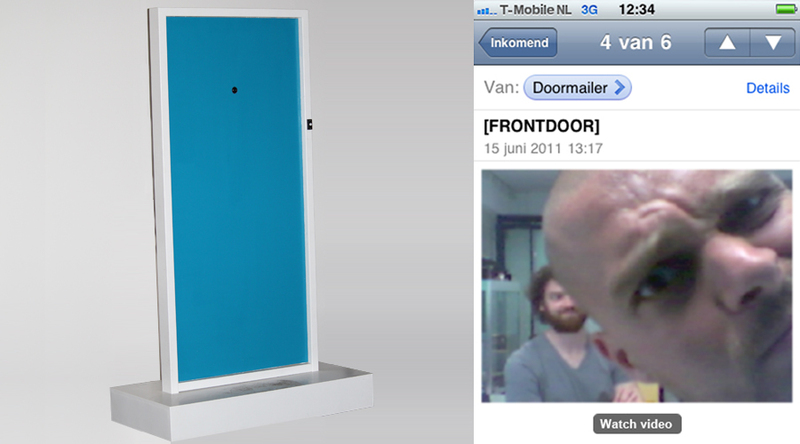 DoorCam is a webcam embedded in your frontdoor. When a person rings your doorbell, it will create a short video which automaticly gets send your smartphone via email; notifying you of the visitor! PigeonSweep deals with those pesky pigeons on your balcony. 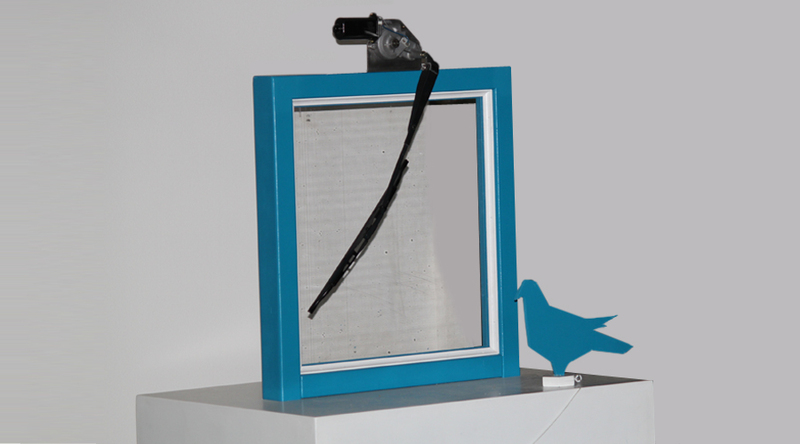 The combination of the sensor together with the windshield wiper just sweeps the pigeons away! A short video impression of the dance performance. In EX::POSED photos are tethered from the camera to the computer, live selected and edited after which they are project onto the stage. Visual Rhythmics is a DIY electronic drumkit build not to create audio but instead trigger visuals, and therefor used for physical VJ’ing. Future Impression is an Interactive Installation build by Kris van der Werve. Five little 3D objects as actuators telling the story of their impression of the future; about Transport, Living, Working, Watermanagement and Leisure. In this project I’ve build all the sensoring and written the code with the use of the OpenFrameWorks library. Live Forum is a 3D visualisation of an Interactive Disscusion Table. SMSWall is a projected wall to which you can send SMS texts. Once a text has been sent, it comes flying in and joins the other scrambled messages. Once “Show” is sent a random message will be unscrambled and shown on the front. Bazar is a video installation with projection on white masks. The sound is mixture of five different languages corresponding with the five different projections. Highway Psychosis is a videoclip based on a soundtrack by Mink Lammertink. It’s an abstract visualisation of a psychotic man, in between heavy traffic. Celluloid Remix is a remix video with footage from an old celluloid archive. We used a selfmade methode of Live Video Scratching.